Though I didn’t paddle today, I had a very enlightening training session on the running track instead. I was up later than usual last night after a friend popped by with three large bottles of beer and some leftover chocolates from Easter. First mistake! I slept around 6.5 hours, scoffed a banana and some Zeal wellness blend and off I trod with the intention of running for an hour or 10km before paddling later this afternoon. There were the usual characters at the running track when I arrived around 9:30am. The kids doing sprint practise, the elderly men who stray between lanes as they shuffle forward, the women who do Tai Chi and then walk in one long line crossing four lanes, and the men who usually do the same but in the opposite direction (though today they were all just sunning themselves on the sideline). After five minutes of running the pain in my right knee that has troubled me for the last couples of months flared up expectedly. I’ve found that stretching helps, and I even rubbed some good old analgesic lotion that Dr Sole gave me on the PCT around the joint. Once the knee settled and I found my rhythm I clocked an hour and figured I’d just keep going. 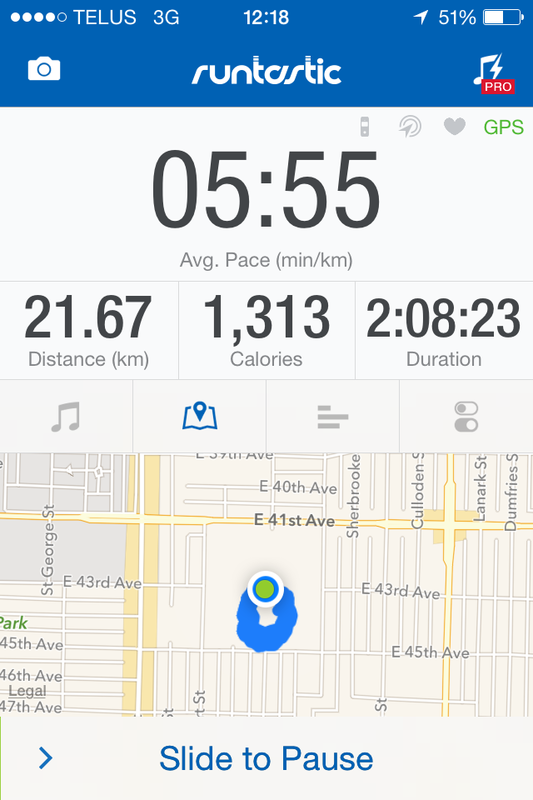 The longest I’ve ever run is 13km, and that was about two weeks ago. I’ve never been into running because I never believed I could run. I would always get an incurable stitch after five minutes and even if I were able to get rid of it, I’d rarely make it 5km. 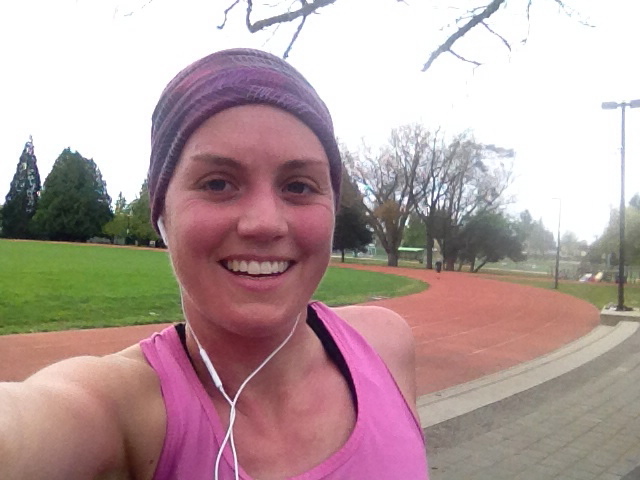 Running simply felt like a horrible chore that only elite athletes or crazy people enjoyed. But when I decided to try running as part of my training back in February, the first time I hit the track I ran for an hour non-stop, which made me wonder if it’s just mind over matter or simply dependant on how fit I am. By 90 minutes I was up to 16km, which made me believe I could push a little further and reach the distance of a half marathon (21km). The sun was out, I was sweating profusely, but I didn’t feel at all thirsty and stopped only for a few arbitrary sips of my water bottle, (which was sat beside the group of men on the park bench watching me run in circles). The onset of hunger came on hard but eventually disappeared, as I had nothing with me to eat. Then after 128 minutes and 54 laps of the 400m track, I’d suddenly run my first half marathon of 21.6 km. I drank some water, stretched, and walked home feeling a million bucks. I had some Zeal protein powder, soaked my legs in a tub of Epson salts and then went about my business. Twenty minutes later I realised I was starving. I cooked up some oats, covered them with flax, chia seeds, hemp hearts, raisins and maple syrup and began eating, but halfway through my stomach somersaulted and I started feeling terrible. I stopped eating, rested my head upon my desk and took in some slow breaths before my body took to the floor where I shot this video. I still had wild hopes of making it down to the water to paddle but my body was having none of it. After two unpleasant trips to the bathroom I went to sleep for an hour and then slowly made my way to the shop to buy some electrolytes. The whole experience was enlightening for two main reasons. Firstly because I was able to push myself a lot further than expected while finding a comfortable zone where I felt I could have run for much longer if I had food. And the second and more important lesson was that no matter how good I might feel, the body still requires constant care to function. I always eat and drink plenty of water on my longer 5-6 hour paddles, so I’d never experienced something like this before. I have to say I’m incredibly grateful that it happened to me now. It was a timely reminder and a wake up call so I can adapt my behaviour for my upcoming training sessions. The next time I’ll paddle will be at the weekly Tuesday Night Race (TNR) series over at Deep Cove. I paddled the Epic 18x performance kayak last week, which is similar to what I’m hoping to paddle in the Yukon River Quest. It felt great, and I wasn’t too far off the pace of the fastest women who were paddling slightly faster surf skis. The Epic 18x feels similar to a surf ski in the way the rudder is controlled by pedals directly above the centre of the footplate. The pedals of most sea kayaks are angled to the side, which means your legs are bent at a strange angle instead of resting straight. I still need to confirm my boat rental, my paddle, the majority of my gear and my food. Pretty much everything, other than my training which continues to tick over. I was at the gym rowing on Saturday night, went for a long walk on Friday, have been doing Pilates once a week and the rest of the time I’ve been working and figuring out logistics, gear and food for the race. It’s a part time job on top of my other part time job so the weeks are filling up fast and time seems to be flying. By the end of this week I at least want to have my clothing sorted! Until next time, thanks for following the journey! Lessons learned = don’t repeat mistakes. Never saw or thought of you as a runner – not least for a 1/2 marathon distance. Go L1. Maybe you should take up swimming next – how far is the island? Ha ha. Don’t even think about it or going to space please. Try an energy gel every 45ish minutes that you run. You will still need water but that will help too. Thanks Arian! I’ll definitely prepare better for next time! So you ARE “human” after all ?!? Sorry to hear how bad you were feeling. But like you said, better to learn those lessons now. All of your ideas for the cause of the problemes seem valid. Sounds, to me, like a combo of everything played havok on your system. WOW, what a great run you had !! Harness that joy and put it in the bank for later. I am sure you will be able to use it soon enough. Use your time wisely, it does pass quickly when preparing for something so big. Thanks for the wonderful words and constant motivation Lyndella!! Reading about you running is motivating me to get back out there. I’m not a natural runner, however I always enjoyed signing up for 5ks and even 4 half marathons! Something that really helped my knees and shins, calves- was BIOFREEZE! Love that stuff. Also rolling on a foam roller. If you haven’t tried foam rolling! check it out! So simple and it feels so gooooooood. Great job on the workouts! Thanks Minda! I’ll have to check out biofreeze as I’ve never heard of it before. I own a rumble roller with little nubs that dig right into the muscles. Hurts like crazy but I agree it helps so much afterwards! Oh, shoot…..not a fun time, for sure…..I think that what Lyndella from Alaska about feeling bad after your run was really so much happening all at once….”What! !….you mean you’re human!! !….wow, I always wondered about that!”……it’s kinda funny that Lyndella said that because that’s exactly what I thought…..smiling …..
You know what, I am really wishing you would not take that river trip by your self…..That river can be mighty scary….would you kindly consider being with others, sweetie…..
Knowing what i come to know about you, I think you have a brave heart to even try it, but you are challenged and want to do it alone, maybe just to see if you can…..I know you could do it and will be able to do it….but, to be alone without help if you needed it, would be terrible….. Please think about it, Suzanne….just give it some really serious thought, and ask for some wisdom from others who have taken that kind of challenge before…..please …..